Recipe #9 in our 2012 edition of the 12 Days of Christmas Cookies. We cut out gingerbread boys, angels, bears and snowmen; and let the kids decorate. Mix brown sugar, shortening, molasses and water in large bowl. Stir in remaining ingredients except Creamy Frosting. Cover and refrigerate about 2 hours or until firm. Lightly grease cookie sheet. Roll one-fourth of dough at a time 1/4 inch thick on floured surface. 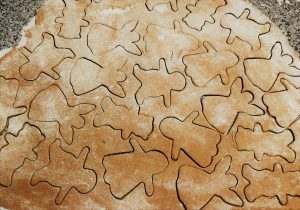 Cut with floured gingerbread cookie cutter or other favorite shaped cutters. Place about 2 inches apart on cookie sheet. Bake 10 to 12 minutes or until almost no indentation remains when touched in center. Remove from cookie sheet. Cool completely before decorating. Prepare Creamy Frosting, mixing all ingredients until smooth. 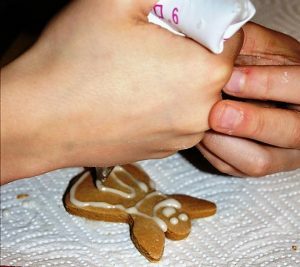 Spread or pipe on cookies. Yield: About 2 1/2 dozen 5-inch cookies, or about 5 dozen 2 1/2-inch cookies.